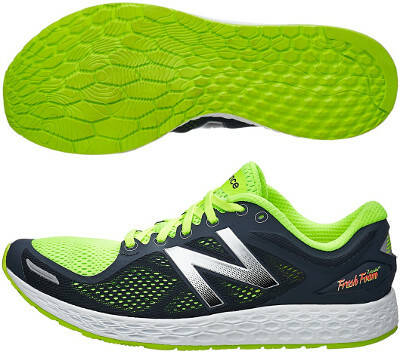 New Balance Fresh Foam Zante v2 are neutral performance running shoes. The New Balance Fresh Foam Zante v2 is actually the 1980 v2 (with third edition of Fresh Foam compound) but it seems that Boston's brand is moving away from numbers in running shoe codenames. Lighter and more responsive than its bigger sibling the Boracay v2, with 6 mm drop and good cushioning the Zante v2 is a great choice for neutral runners in wide range of scenarios from uptempo workouts to daily trainings. Upper in Zante v2 follows bootie construction trend for plush comfort and engineered mesh comprises the midfoot providing improved breathability with around 10% weight gain from its predecessor the Fresh Foam Zante. The N logo is the biggest reflective element in order to increase visibility under poor light conditions. Midsole in Fresh Foam Zante v2 is completely made of the third iteration of the flagship material from New Balance (in a similar way as Adidas does with Boost™) for optimal balance between cushioning and stability. Outsole has been redesigned with different size elements depending on the area and smaller crash pad for smooth transition.